Mike didn’t speak much English and sitting in the chair in his barber shop draped in a blue smock, I couldn’t remember the Spanish word for shave. He understood the basics of what I wanted based entirely on the company I was in – three Americans with half their heads shaved. The difficulty was that I wanted something specific. “Dos estellas con solo la linea, pelo afuera y adentro. Corta solo la linea,” was all I could manage in my rusty Spanish. Translation: “Two stars with only the line, hair inside and outside. Cut only the line,” or at least that’s what I hoped I’d said. Unsmiling Mike nodded in response and went to work, fast and efficient with his straight razor. I hoped for the best as my brown hair fell to the floor. Two stars are a traditional sailor tattoo. If you can get a navigational fix on two celestial bodies with a sextant, you know where you are. If you carry these stars on your body, you’ll never get lost. That’s what they used to say. 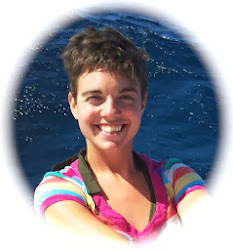 I’d like to get a twin star tattoo to commemorate my circumnavigation. In Mike’s Barbershop I settled for a celestial fade. I’ve wanted a fresh fade-a shaved canvas of intricate designs carved into my hair-for years, but have always had some reason, professional or otherwise, to look respectable. On our first full day in Culebra, George and I met Bunny and co, a couple of punk kids from Brooklyn with shaved dos, who called Mike a wizard with the straight razor. Wandering around Dewey that afternoon, the main town on Culebra, the northernmost inhabited island in the Spanish Virgin Islands of Puerto Rico, I’d seen residents sporting spiraling designs as a testament to Mike’s skill. 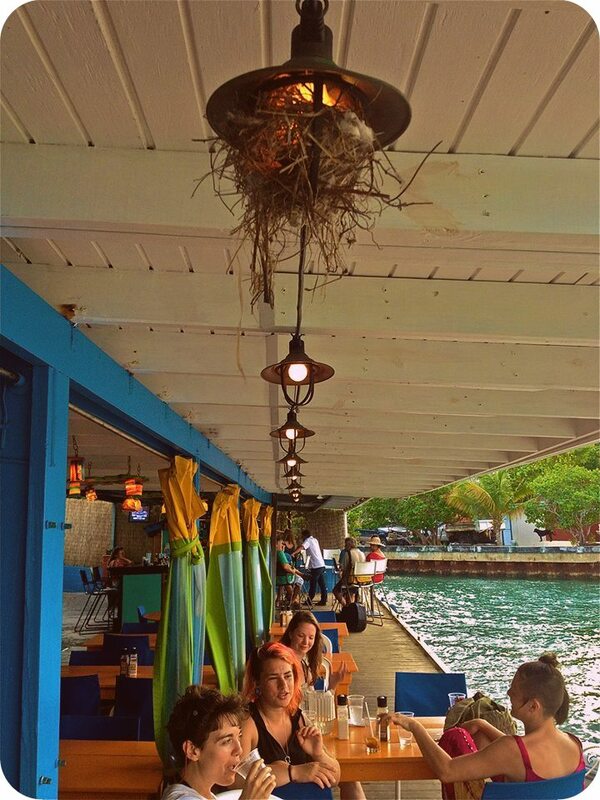 When in Borinquen (the native Taino name for these islands), do as the boricuas. 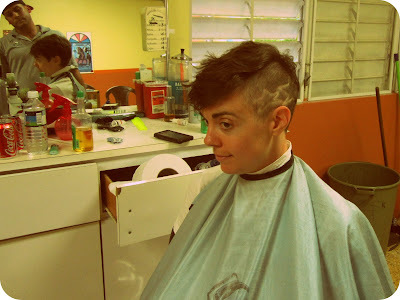 Not that I saw any local women with fades, but hey. 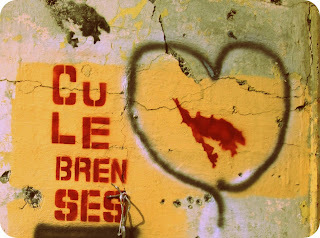 Culebra is an island with a soul. The Culebrenses fought to and successfully reclaimed their island from the U.S. Navy over forty years ago. 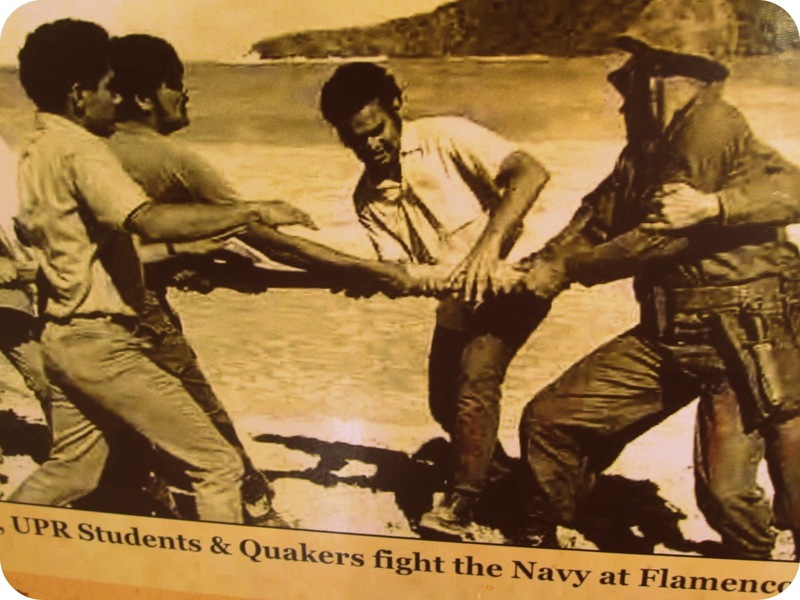 A grassroots movement of students and citizens saved Culebra from being a bombing range. The local leaders are still the heart of Culebra today. 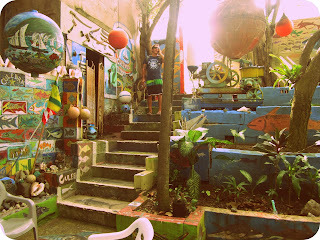 On the right is a graffiti stencil of the island of Culebra. The night before we were set to leave Culebra for our three day passage to the Turks and Caicos, we found out that there would be live conga music at the Dinghy Dock, a bar/restaurant with one long wall open to the waters and breeze of Ensenada Honda (Translation: Deep Cove). 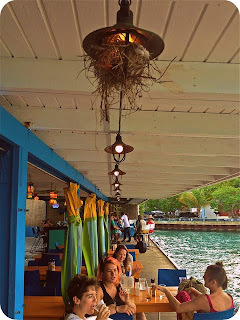 When we pulled up to the dock, conga drums were set up on the deck next to empty stools- the musicians were nowhere to be found-and amplified bachata, salsa and pop music was blasting through large black speakers on the floor. We threaded our way through the dance floor to the bar and ordered two Presidentes, local beer brewed in the Dominican Republic. I sat with George sipping my beer watching the dancers until the pull of the music became stronger than my timidity. I asked George if he wanted to dance, but he was content at the bar. I stepped out onto the dance floor, hoping the strangers around me would welcome a new comer. Making friends at the Dinghy Dock. A full-bodied woman with long curly hair shaking her cadena reached her hand out to me. I wasn’t sure what her gesture meant; did she want to dance couples style and spin me around? When my hand clasped hers I understood. Immediately, a limbo line formed, smiling bodies danced and struggled their way beneath our hands. And that was just the first song! When the congo musicians returned, dancers moved their bodies in time to the rhythm of the drums, slowly at first, then faster and faster to a frenzied pace. The conga music possessed the dancers. Bodies became vessels for rhythm. One woman in a tight orange, one-shoulder tank top lost herself completely to the music and became a blur of hair and arms and hips. And we were all lost with her. Hector, a Puerto Rican from the main island who makes a point of coming to Culebra three or four times a year, told me that this dance, Bomba de Plena, is part of the African heritage of Puerto Rico. 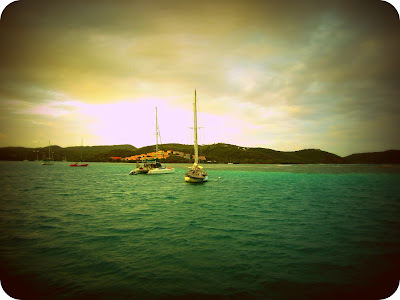 Anchored behind the reef in Dakity Harbor, Culebra. We got back to the boat after midnight and though we were leaving the next day, we didn’t plan to head out too early. After three days in Culebra we said good bye to our mooring behind the reef and set sail to the Turks and Caicos Islands, one of the most beautiful natural structures on earth.